Eric is a F class champion, you'll see his name often in national shoots, usually toward the top. He is not your average YouTube mall ninja Reloader. Learning to be quick and deadly, takes practice! Rifles are like women, every one is different! I tried it on several different occasions. Here is the problem, you adjust your die to full length size properly, then screw up the adjustment for neck sizing, have to adjust your expander ball position, then re do the whole thing when you full length size. You have to use lube on the case when partially full length size for neck sizing only, and if you don't, you will end up putting scratches in your die. Lee collet neck sizers are probably one of the most unappreciated pieces of reloading equipment on the market. Sizing pins come in .001 increments from Lee, and Grangers sells pins graduated in .0005 increments. Neck run out with Lee Collet sizers is absolutely fabulous. Another issue on the lee collet sizers is that the Ackley Improved cases will work on a standard parent case sizer. This saves a guy a bunch of money vs bushing die plus several bushings. 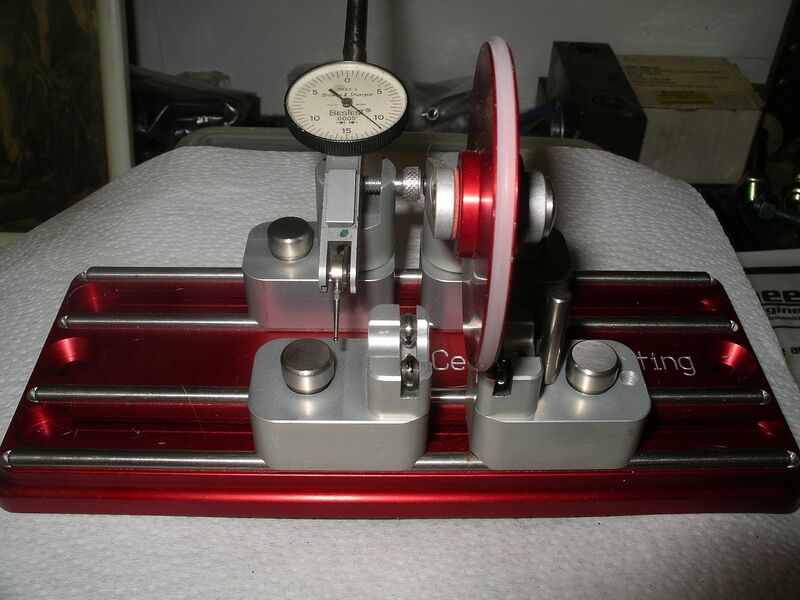 I use hornady lock rings on my lee collet sizers. I stopped neck sizing 40 years ago. Created nothing but issues and didn't help accuracy at all. I do like the Lee collet die with the Redding body die every time. Good information, Keith. XTC match shooting doesn't require the one hole groups that BR does fortunately, but that does not mean we didn't try to squeeze the most accuracy we could from our ammo and equipment. For my purposes, runout was more important as the range increased. I'm not sure if bushing neck sizing dies were even available or the Lee Collet dies but I learned early on that runout largely was induced when pulling case back over expander ball in the sizing die. 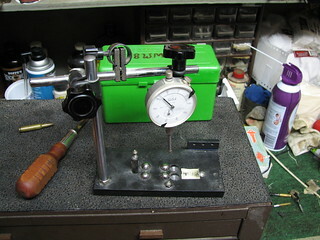 I replaced expander with an floating carbide expander which helped; setting the expander ball as close to the neck sizing portion of die without overlap also helped, but still was a problem until I sent my sizer to RCBS along with several neck turned cases and they reamed the die to produce proper tension w/o using the ball. Not perfect but much better according to my home built concentricity measuring tool. I really like the drive wheel on your store bought tool; I'm sure it is more accurate than turning by hand. Who makes that fixture? Clarence, my tool is made by 21st century, but yours needs NO upgrade. If you were to up grade your tool, it would be to use an inexpensive .0001 indicator or a .0005 indicator. These indicators basically tell you when your necks are starting to get hard because the crimp die does such a good job of sizing. Hard necks are difficult to form in any die. Since brass will vary as much as 6% in non lapua brass brands, it is easy for run out to go .006 on hard necks. I did not get into the Lee Crimp neck sizers till a few years ago. I will probably end up selling most of my bushing dies as the Mandrels in .0001 to .0005 gives a guy a lot more control on neck size for not much money. Guys are afraid to use the Lee Crimp neck sizers thinking that they will not get consistent neck tension but the opposite is true. On the bushing dies, a simple S type of die will run $55 shipped or close to it, then two titanium bushings or More, and you are looking at $100 bill easy. Lee Collet neck sizer is half that plus the price of an extra mandrel from Lee. No doubt that the Lee Collet neck sizer is an upgrade in run out from a std S Die with bushings. Bushings are a quagmire of problems, possibly, for a nit pickers nit picker...I will not go into the details. The best of the bushing neck sizers is the Redding Competition neck bushing die where the case is fully supported before it inters the bushing, if there is too much slop in the machined hole that holds the bushing, then there can be a problem with alignment with a slightly cocked bushing. A friend that is a bullet tester with Berger bullets and a 1000 yard benchrest shooter found the best run out with Forster Neck sizers where he had Forster ream out the neck dimension to what he wanted...cost $12! This guy is such a nit picker. The std forster neck sizer will bump shoulders also...added bonus. I have been bumping shoulders with the Forster std neck sizers since the early 80's saving a lot of full length sizing and case trimming. Very often, the case does not need the web sized but the shoulder pushed back .001 or .002 is all that maybe needed. This shoulder bumping is a reloading trick to strive for and master instead of full length sizing. I use Whidden and Harrell full length bushing sizers on my real serious non hunting rounds. ON some, I do not use a bushing, then use a mandrel in the collet lee die, and/or run a mandrel through the case mouth when sizing. 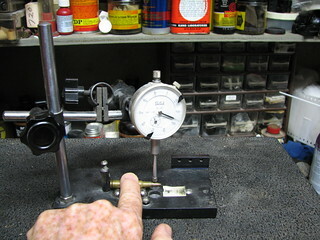 Run out gauge tells all hoping for .001 or less in neck turned cases. I really need to try my buddy's method of std forester neck and FL where the neck has been reamed. Eric really knows his stuff, and that is an understatement!